28 January 1547 – The King is dead! Long live the King! On Friday 28th January 1547 the fifty-five year-old King Henry VIII died at the Palace of Whitehall. 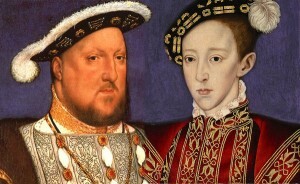 His death was kept secret until 31st January, giving the King’s Council time to discuss what was going to happen regarding the accession of Henry VIII’s nine year-old son, Edward, who became King Edward VI. “The 31 of Januarie my lord major was sent for to the Perliament Chamber at Westminster, before the lordes of the Kinges Majesties Privie Counsell, and their was declared to them by my Lord Chauncelor and other the death of the Kinges Majestie Henrie the Eight, our Soveraigne Lord, which deceased to Almightie God on Fridaie last, being the 28th of Januarie, and straig[ht]ly charging them to keepe the Kinges peace and to loke the savegarde of the Kinges Majesties Chambre of London, and so they departed. You can read more about Henry VIII’s final days in my article 28 January 1547 – Henry VIII dies. Beth von Staats, author of Thomas Cranmer in a Nutshell has written a moving fictional account of Henry VIII’s last days over on the Tudor Society website. Click here to read it now. Today is also the anniversary of the birth of the Tudor dynasty’s founder, King Henry VII, in 1457 at Pembroke Castle – click here to read more about this. Hall, Edward (1809) Hall’s chronicle: containing the history of England, during the reign of Henry the Fourth, and the succeeding monarchs, to the end of the reign of Henry the Eighth, in which are particularly described the manners and customs of those periods. Carefully collated with the editions of 1548 and 1550, printed for J. Johnson; F.C. and J. Rivington; T. Payne; Wilkie and Robinson; Longman, Hurst, Rees and Orme; Cadell and Davies; and J. Mawman; London. p.868. Wriothesley, Charles (1875) A chronicle of England during the reigns of the Tudors, from A.D. 1485 to 1559, Volume 1, Camden Society, p. 178. What was the discussion about, Edward was the next in line for king? I understand his tender age but it should have been a easy transition. He was in his minority and Henry VIII had left instructions for a regency council (of equals) to advise his son, but over the days that followed Henry VIII’s death, his instructions were put to one side and Edward Seymour became Lord Protector, governing England on behalf of his nephew. Henry VIII didn’t want that, he didn’t want one person in charge and influencing his son, he wanted a council of equals helping Edward. was able to get away with this ? Henry had the right idea setting up a Council of sixteen rather than a Lord Protector with the power of a Regent. Henry was hoping to avoid the fates of earlier Protectors and or minority Kings. He also hoped to avoid a power grab, but that is exactly what happened here. Former Lord Protectors had been the brother of the former King or Uncle or other relative, with the support of the Great Council and the former Queen would have a ceremonial role to play. Henry excluded Queen Katherine Parr, probably because of the trouble with her heretical beliefs a year earlier and left clear instructions for his sons formal education. However, Edward Seymour took over and made himself Lord Protector, his brother Lord Admiral, probably on the fact that he was the new King’s oldest living male relative. The Seymour brothers had probably planned this take over for some time. Edward recruited others like William Paulet to gain backing for their take over and had manourvered the old guard out of the way over the previous couple of years, taking advantage to Henry’s susceptibility to paranoia and conspiracy theories to get rid of rivals for power. Just how they really got away with it is amazing but they pulled off a coup and for the next few years, effectively ruled as de facto Kings. Sorry I meant Paget, not Paulet. I love how the same numbers appear in the birth and death years. 1457 and 1547.